Our center is very unique, as it is located in a University setting. We have an average daily population of over 80,000 on our Twin Cities campus alone, which would make us the 6th largest city in the state, within the cities of Minneapolis and St. Paul. We have an amazing team of 17 employees total. They monitor over 4,000 cameras on campus and handle over 100,000 alarms a year. We set up security escorts for students and faculty so they safely can get to different parts of the campus without worry. The team handles the important aspect of access control to the 250 buildings of the University. 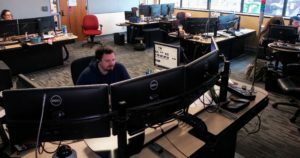 We also answer and dispatch 911 emergency and non-emergency calls for the University of Minnesota Police Department as a 1 stage dispatch center. Our dedicated team puts in countless hours of overtime sacrificing precious personal and family time so our center runs smoothly and the public and officers are kept safe. The team often goes the extra mile helping parents locate their children or helping the officers find out which building a student or faculty member is in that needs emergency assistance. They come in with a great attitude everyday, ready to work whatever emergency comes their way. What I respect the most about each and every one of our team members is they work very hard with little recognition and love what they do.